SCVHistory.com LW3013 | Film-Arts | Hoot Gibson Plane Crash, Los Angeles, 7-3-1933. Western film star and Saugus ranch owner Hoot Gibson (1892-1962) crashed the plane he was flying in Los Angeles on July 3, 1933, during an air race with fellow actor Ken Maynard. Gibson recovered from his injuries at Cedars of Lebanon hospital (now Cedars-Sinai Medical Center) with actoress June Gale at his bedside. At the time, he was estranged from his third wife, Sally Eilers, who was reportedly in Europe. They divorced one month later. Hoot Gibson, Hollywood film cowboy and flier, was cut deeply about the face and suffered severe bruises to his left leg and hip when his plane crashed in a special match race with Ken Maynard, screen cowboy and pilot, at the National Air Races in Los Angeles July 3. 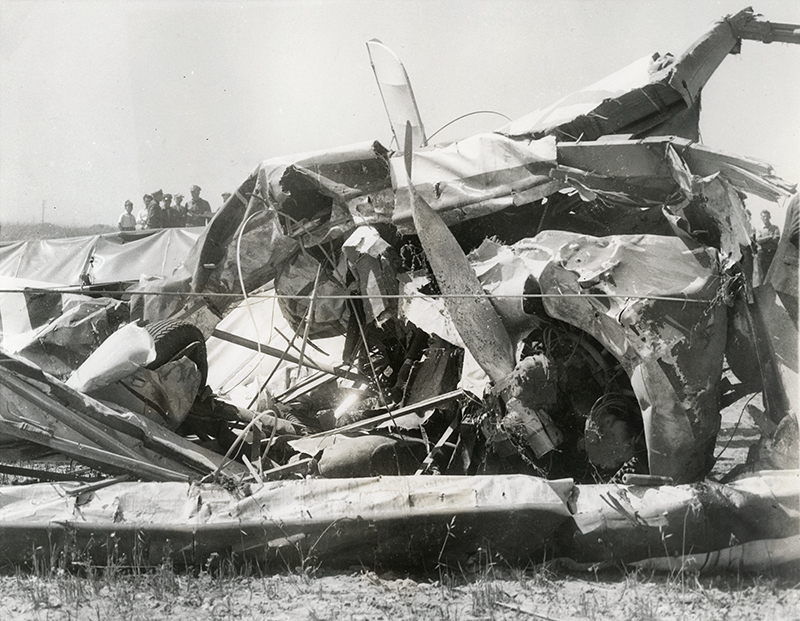 Photo shows wreckage of Gibson's plane. LW3013: 9600 dpi jpeg from original photograph purchased 2017 by Leon Worden.